This battle took place on the same date as the Battle of Pescara on the east coast. This involved the French II Corps vs a Russo-Austrian Corps size force in central mountains between the west and east coasts. These two forces had met before further north at Santi. The French forced the Allied force back. The allies retired to Popoli on the southern side of the Pescara River. There are mountains behind both the allied and French positions but the French have more high ground on which to position their artillery. After losses have been calculated and other factors brought in to be included the battle came to a tactical draw. Will the French attack again, will the Allies attack, will the French withdraw, will the Allies withdraw. 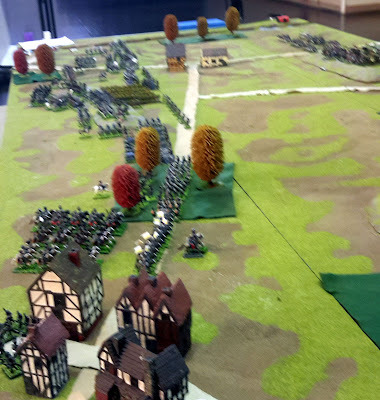 Was great to be back for this game...I had a wonderful day throwing the French forward into the Austrians!